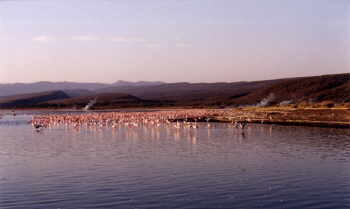 The pink edging on the waters of Lake Bogoria, Kenya (Africa), is not a mirage caused by the intense equatorial sun. Tens of thousands of stilt-legged pink flamingos form a 2-meter fringe in the shallow waters of the lake, a beautiful sight that can only be seen in central Kenya. A subtle movement, as one takes a closer look, is the birds' unique feeding habit. Sweeping their upside down beaks back and forth in a partially circular motion, much like using a scythe in cutting grass, the birds strain the algae and diatoms out of the water with gill like teeth. The algae, Spirulina platensis, thrives in soda carbonate environs. It is the favored food of the lesser flamingos and promotes the pink coloring of their feathers. 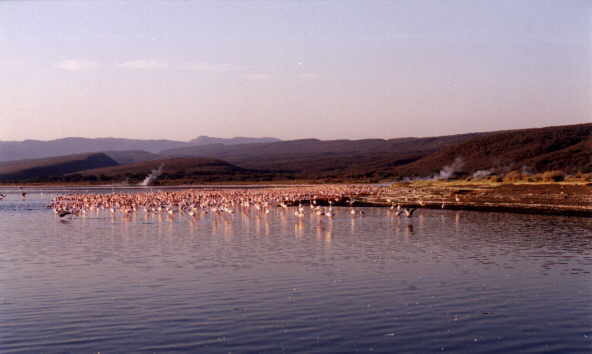 In February, 2000, The Earthwatch Institute, conducted the first exploratory research on the aquatic and terrestial ecosystems in Lake Bogoria National Reserve at the request of the park warden for the county councils which govern it. For several years these concerned residents discussed the Reserve's future with Dr. David Harper of Leicester University, whose 15-year research at Lake Naivasha and subsequent recommendations there, were instrumental in restoring healthy sustainable ecosystems. The findings of the two weeks of exploratory study on Lake Bogoria will be reported to National Reserve warden, William Kimosop, and the county councils. 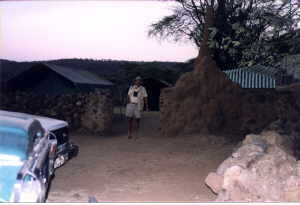 The Earthwatch team operated from a temporary camp at the Reserve's headquarters. The safari was operated by Gregory Mbomere of Tarpo Industries of Nairobi. Double tents with floors and over-canopies were luxuriously accompanied by individual sun showers and pit toilet tents. A welcome touch of civilization after a dusty day of data gathering in the field! Then we were treated to local quisine prepared by a talented and much appreciated cook. Dr. David Harper was assisted by entimologists, Educator Tony Drane and Dr. Tony Cook; aquatic biologist, Dr.Gaynor Evans; ornithologists, Dr. Munir Virani and Maureen Harper; and college biology students, Dorice Agol and Joshua Chebotibin. James Muorgu was a driver and general maintenance man. Vehicles needed a great deal of tender loving care considering the rugged trails they conquered in daily travels to the research sites. Dr. Harper, Joshua, Nbogo, Gaynor and I loaded a rubber boat on the Land Rover for a trip to the lake for water and mud samples. Researchers double as boat loaders and launch the craft in the shallow waters of Lake Bogoria for a sample gathering task.Sampling tools and storage containers are stowed in the boat before launching. This day the water was calm at launch time. Dr. Harper pulls up the "grab" tool full of bottom mud from which midge larvae will be counted. From samples, numbers of larvae will be estimated for the lake. Midge flies contribute to the health of the lake and the birds and animals that live on the larvae in the mud and adult flies after hatching. Geysers periodically spray boiling water from some holes and merely bubble boiling water from others. Exploratory research included study of the algae in the lake water and fresh water from the geyser streams. Earthwatch volunteer, namely me, finds the temperature of the water at the bubbling springs to be 96 C degrees. No algae is growing here. I could have made a cup of tea. Dr. Gaynor Evans, aquatic biologist, collects algae samples at various transects along the stream of cooling water for later laboratory analysis. Fresh water insects were netted and visually examined then taken to the laboratory for pinning and display. Other insects were captured in nets as they were beaten off the trees and bushes. Dr. Crane and Tony Drane each prepared a collection for further study. Three areas upslope from the lake shore were set with pittraps to collect night roaming insects. Tiger beetles were the most common insect captured. 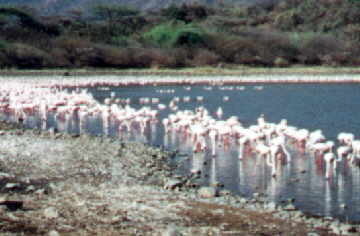 Flamingo carcasses were counted daily on transects along Lake Bogoria's western shore. The example below was attacked by an eagle, which took the breast for its breakfast, and later by a Marabou stork, which dined on the intestines. Other predators that mangled the birds beyond recognition included warthogs and wild dogs. 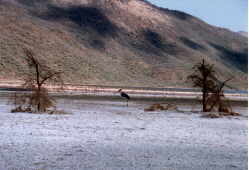 Baboons would grab flamingos by the neck and carry them into the hills. Unseen predators were surmised by tracks left in the soft mud. Animals known to be in the area were mongooses, honey badgers, hyraxes, and hyenas, probably feeding in the cooler pre-dawn hours. and its research work around the world visit http://www.earthwatch.org You may find some research that you want to help. Donations to research projects are tax deductible and actually going to a project site to assist scientists is a great satisfaction. Take a look at the work the institute does in many countries.